So while I am playing catch up, I need to post about birthdays, the good, the bad and the ugliest cake ever! I kid you not about the cake. 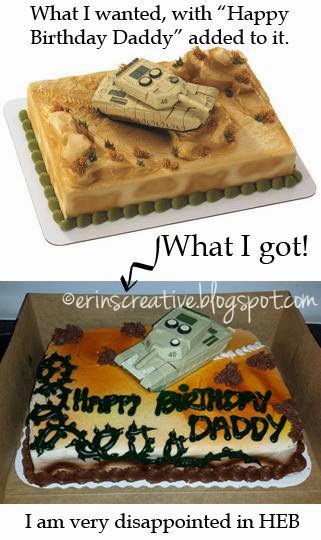 My husband mentioned that a coworker told him about how our local grocery store had a tank cake. With my husband being a former tanker in the Army, I had to go check it out and order it for him if it was up to my standards. I saw the photo in the book and thought it looked pretty awesome. I ordered it and I will let the photo below speak for itself. I am no longer disappointed in HEB. I was the day I picked up that cake. I even spoke with the bakery manager about this atrocity. She tried to defend it. Big mistake, Big, HUGE! (can you guess the movie reference there?) That's why I made the above photo collage and then posted it on their Facebook page. Since it was a custom order, I had to buy the cake (they originally gave me half off), but couldn't remake it. Normally this bakery knocks out stellar looking cakes, not for my husband though. I blame his bad luck for this. At least we could laugh, along with all my friends on facebook about this disaster. I later spoke with the store manager, laughed pretty heartily with her about it and then I spoke with another manager from the store who oversees that area and they refunded my money. Happy birthday hunny! I hope next years cake is not a repeat performance in ugliness. So, I started with the bad and ugly, now onto the good! "Wake up mommy, it's my birthday!" "Go back to bed, it's still night night time." "No, go back to bed." My little monster, really hammed it up all day long. He told strangers all about his birthday, teachers, the car that pulled up next to us at a stop light. He also wanted to look nice on his birthday, so I let him pick out a new shirt. The handsome little man has my taste is obnoxiously printed shirts. He chose that one for his birthday shirt. LOVE IT! It's hard to believe just how fast he is growing up. 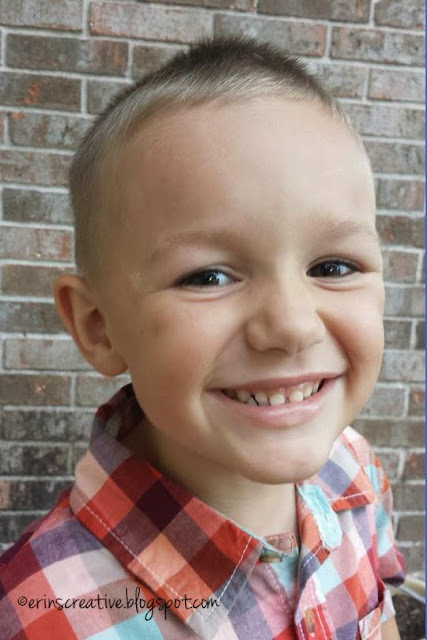 I look at this photo and can't believe he is only 4 with that chiseled little jaw line. Happy Birthday Colton. I hope four brings you a lot of happiness, a lot of interests and crave for knowledge, lots of silly moments and a whole lot of fun.